Making a good cup of coffee at home can be tricky, let alone when you’re traveling. But the art of getting the best cup of coffee is made simple with an ingenious idea by Kara Cohen and Ilana Kruger, co-founders of Dripkit. The Dripkit is a portable, single-use packet that contains everything you need to make a pour-over style cup of coffee on the go. No grinding, measuring or specialty gadgets required. Cohen and Kruger designed over 100 prototypes before settling on the final design, which uses biodegradable packaging and weighs less than 20 grams. Much like preparing pre-packaged tea, all that’s needed is hot water and a cup. Each packet contains a filter, a dripper and the perfect amount of coffee. 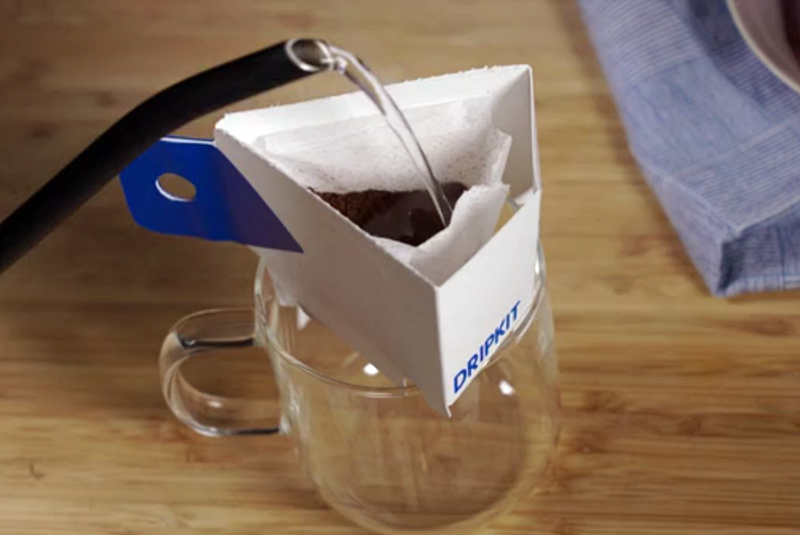 The Dripkit can then be placed on top of your cup, and water poured through. The nifty foldable design helps to keep the dripper stable and in place while you pour, and folds back up for easy disposal. Each Dripkit contains a blend of beans sourced from Guatemala and roasted at City of Saints in Bushwick, Brooklyn. Each packet is sealed airtight within seconds of roasting to ensure the freshest tasting coffee. Dripkits taste best within the first month, but are good for up to six. The Dripkit is currently up for funding on Kickstarter, where it has already surpassed its initial goal. Those who back the campaign now will get their gifts in October, while the product officially launches in November.